Culture has come to the forefront of many business leaders’ minds lately due to attention around issues like sexual harassment and diversity. The problem is that most leaders don’t know how to cultivate a corporate culture that is lively and sustainable, or else they are going about it the wrong way. 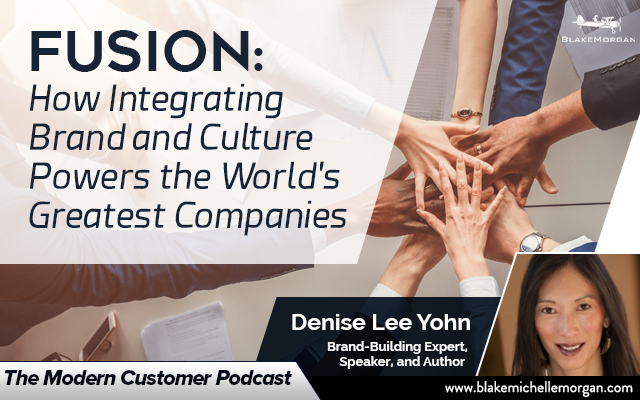 Denise Lee Yohn, author of the book Fusion: How Integrating Brand and Culture Powers the World’s Greatest Companies, says the thing most companies are doing wrong is thinking there is one just kind of culture they need to create. Many leaders see companies with great cultures and feel they need to imitate them exactly to create cultures that are warm and fuzzy with lots of perks for employees. That’s not the case. What really makes a strong culture is something that represents the brand’s mission and values. Yes, it should be a nice place to work, but the companies with the best results create cultures that are unique and represent who they want to be as an organization. Instead of thinking as culture the same way as everyone else, leaders should find something that represents their brand and encourages employees to produce the results the company needs them to. That doesn’t always mean perks — as Denise points out, perks are just the tactics many leaders focus on instead of addressing the underlying foundation and strategy that makes a successful culture. Great snacks or a free gym might make employees happy, but it usually doesn’t truly engage them, and the appeal could soon wear off. True culture is long-lasting and goes beyond just nice things in the office. Companies should be confident in their culture and own it. It’s misleading when a company misrepresents its culture, only for employees and customers to find out that things aren’t really how they seem to be. Organizations need to have an internal culture and outward identity that are aligned so they are authentic in all they do. Intentional cultures start from the top with an executive team that takes responsibility. Culture isn’t built on its own, but rather requires a concerted and deliberate effort. The CEO and his or her team should think about things like the organization’s purpose, core values, and unique attributes. Those ideas can drive culture and allow the company to create something fresh that stands out from everyone else. A good culture is sustainable and creates a competitive advantage. Denise shares MGM’s cultural transformation as a good example of how to create a strong culture that engages employees. MGM used to be thought of as an average Las Vegas hotel and casino, but the company wanted to transform into an experience-based brand. All of the company’s employees had to get on board with the transformation, so MGM brought in a training team to work with all 177,000 employees in person. Starting with leaders and working through the various departments, everyone was trained on the new culture so they could embrace the new brand identity. MGM wanted each employee to “be the show” and realize his or her place in creating a show for guests. Investing time in reaching out to all employees helped MGM change its brand and its internal culture into a place where employees feel valued and know they are contributing to something bigger. As a result, MGM has seen an internal transformation and financial gains. Culture is vitally important to a brand’s success. It is strategic and something leaders should be focused on and very involved with. Instead of focusing on tactics that don’t work, Denise encourages companies to decide that makes them different and build a culture strategically. Creating a unique and sustainable culture can truly turn a business into a strong and successful company.